Address:Cusack Stand, St. Joseph's Avenue, Croke Park, Dublin 3. 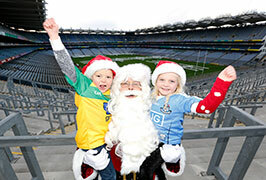 Visit Santa and the Elf Training Camp in Croke Park this Christmas. 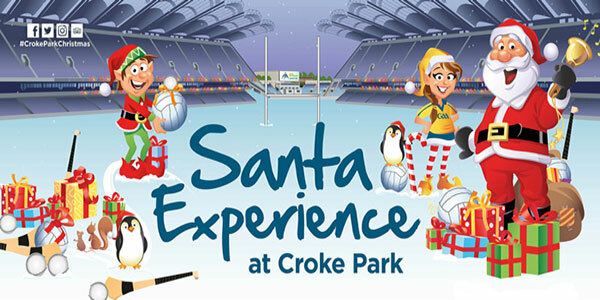 Join staff of the GAA Museum for the return of the popular Santa Experience, a traditional Christmas at Croke Park. This unique family experience includes a visit to the Elf Training Camp, a meet and greet with Santa in his grotto and a sneek peek pitchside! This wonderful new winter experience for families is sure to be a hit, especially those with a passion for Gaelic games. There will be plenty of beautiful festive family photo opportunities with Santa during the tour. All children who visit Santa receive a present. There is free on-site parking. Croke Park’s new Santa Experience also includes free admission to the GAA Museum, where families can discover two floors of interactive exhibits. Children can pick up their Junior Explorer passport and follow the special route which highlights some of the most fascinating and famous exhibitions, including the original Sam Maguire and Liam MacCarthy cups. A highlight for many is the museum’s Interactive Games Zone, where you can test your own hurling and football skills – see how fast your family can react, check your passing skills and practice a fingertip save or the art of the high catch! And you can finish off the perfect day with light refreshments and a festive snack in the museum’s Blackthorn Café. Or you could pick up the perfect stocking fillers for the GAA fan in your life from the GAA Museum Shop!. Booking Online :- You can book on line here through our booking link directly to the Santa Experience in Croke Park ticket sales. Booking Online :- You can book on line here through our booking link directly to the Santa Experience in Croke Park ticket sales. Note that all tickets are subject to booking fee charged at 5% per ticket.